Coop, Roost and Run-- all in one! Price includes delivery and full assembly on your site! Extra sturdy and durable! Not just functional but attractive too! All-in-one design is easy to manage and easy to clean! This American-made coop will comfortably house your flock with a generous amount of room. Each coop has built-in nesting boxes, a fully enclosed safe housing area and a completely secure enclosed run. Sold with prices that include all DELIVERY and FULL ASSEMBLY (see locations stated below). 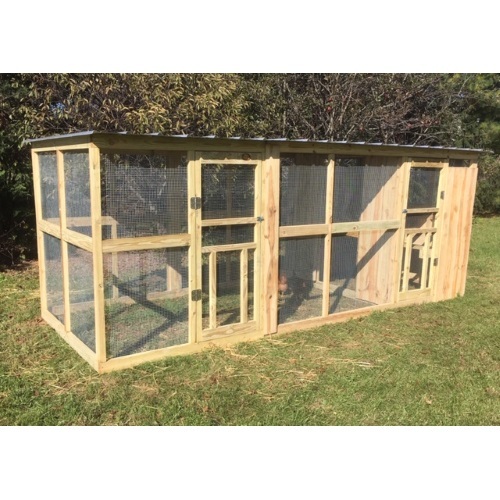 Our top-quality chicken coops are sold to the following states only: Alabama, Arkansas, Florida, Georgia, Kentucky, Louisiana, Maryland, Mississippi, North Carolina, Ohio, Pennsylvania, South Carolina, Tennessee, Virginia and West Virginia. If you do not live in one of those states but wish to purchase one of our chicken coops, please email us and we will see if special arrangements can be made (fees may apply). After purchasing one of our chicken coops, a crew member will arrive at your property in 2-4 weeks to fully deliver and assembly your chicken coop. Please make sure that your check-out address is the address for delivery and assembly. Also, please make sure that your phone number is correct. No worries and no fuss trying to assembly your chicken coop; no following vague instructions. Just purchase and wait for your chicken coop to be delivered and assembled. Prices are inclusive and include this delivery and assembly fee.